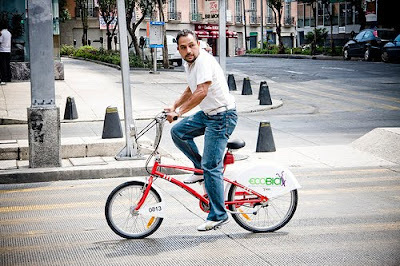 According to Copenhagenize.com, Mexico City repealed its bike helmet law in February 2010 to make way for Ecobici. Copenhagenize reports, "The Institute for Transportation and Development Policy [ITDP] were instrumental in getting the law repealed but there was also support from within the city government." With Melbourne's bike-sharing service being the only service in a jurisdiction that requires wearing of a helmet, will Melbourne and Australia follow Mexico City's lead? A Bike Share proposal was just passed in San Antonio, TX. Yesterday as well! I don’t think we'll see the laws in Victoria change in relation to helmets. It actually seems to be the most successful law in terms of being accepted across all states in Australia. Mike Rubbo (http://www.situp-cycle.com/) has suggested that helmets should only be used depending on the category of the bike. For example, if the bike forces the rider to be in an upright position and it is limited in terms of speed (the BIXI's are 18kg's) then there shouldn’t be a need for a helmet. I'd love to see the helmet laws in Victoria get scrapped. They've been a prohibiting factor in the take up of cycling for too long and the net health gain (less head injuries) does not equate the net health loss (a population that gets far less exercise). Add in a Bike Share system and all you have is a joke of a system that will not get utilised. However Melbourne's bike hire system has many more problems than just the helmet laws!